Wounded Warriors: Wasteful spending alleged. 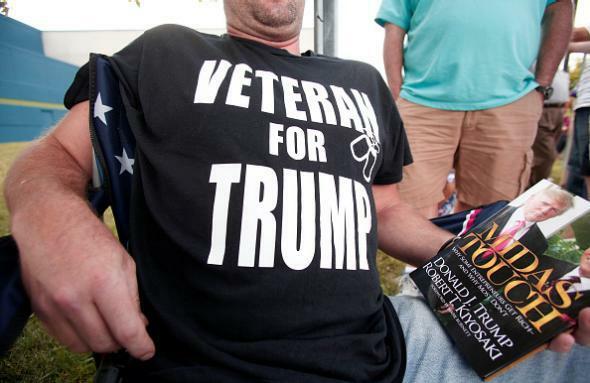 An Army veteran at a Trump campaign event in Birch Run, Michigan, on Aug. 11, 2015. On Tuesday, Donald Trump told reporters that he was skipping Thursday night’s Fox News debate to hold a benefit event for the Wounded Warriors veterans’ charity. Whether Trump’s Drake University event will indeed benefit that organization or another veterans’ group is unclear, but either way this is not the first time Trump has made a point of touting his support for Wounded Warriors, which is one of the country’s most high-profile veterans’ nonprofits. According to new reports by the New York Times and CBS News, though, it’s also one that spends an unusually high amount of its money on luxury perks and events—a characteristic that gives it something in common with Trump, a luxury-obsessed billionaire whose own documented levels of charitable giving are remarkably low. [Wounded Warriors] has spent millions a year on travel, dinners, hotels and conferences that often seemed more lavish than appropriate, more than four dozen current and former employees said in interviews. Former workers recounted buying business-class seats and regularly jetting around the country for minor meetings, or staying in $500-per-night hotel rooms. The organization has also spent hundreds of thousands of dollars in recent years on public relations and lobbying campaigns to deflect criticism of its spending and to fight legislative efforts to restrict how much nonprofits spend on overhead. CBS notes that Wounded Warriors’ spending on “conferences and meetings” rose from $1.7 million in 2010 to $26 million in 2014. The charity spends only 60 percent of its money on veterans’ services, a number that compares poorly, for example, to the American Veterans Charitable Service Trust’s 96 percent and Fisher House’s 91 percent. The watchdog site Charity Navigator awards Wounded Warriors only two out of a possible four stars for its financial practices, while the Charity Watch site gives the group a “C” rating and does not list it among its top-rated veterans’ organizations. The Times piece also quotes former Wounded Warriors employees who say that the organization’s leaders are more concerned with public relations and marketing than with substance and that internal criticism is suppressed via sudden firings. Wounded Warriors CEO Steven Nardizzi told the Times that he believes the charity strikes “the right balance” between perks/marketing and services, and a spokeswoman said the fired employees identified by the Times had been let go because of poor performance and ethical breaches. A former employee told CBS that Nardizzi has made entrances to staff meetings by rappelling down the side of a building, riding a Segway, and riding a horse. Candidate Trump, meanwhile, has not donated to his own nonprofit foundation since 2008 and has not released evidence of personal donations in that time frame to other charitable groups. Trump claims a net worth of $8.7 billion; the Trump Foundation has assets of $1.4 million. For comparison, that makes the Trump Foundation about 3,000 times smaller than the personal foundation created by billionaire former New York Mayor Michael Bloomberg. Pressed by the AP on the details of his contributions, Trump campaign spokeswoman Hope Hicks provided a partial list of donations that appeared to correspond with the foundation’s gifts — indicating that Trump may be counting other people’s charitable giving as his own … The Trump campaign did not respond to a request that it identify donations that Trump himself gave. The Smoking Gun has reported that Trump—who has referred repeatedly and often inaccurately during his campaign to the events of Sept. 11, 2001—is associated with only one documented gift to a 9/11 charity, a $1,000 donation through his nonprofit to a 9/11 Scientology program co-founded by Tom Cruise. * A Trump campaign spokeswoman said in response that Trump had made “close to half a million dollars” in personal (nonfoundation) 9/11-related donations, but the campaign has not released documentation of those gifts. In any case, given Trump’s claimed net worth, 9/11 donations of $500,000 would be the equivalent of someone with a net worth of $100,000 giving away about $5.75. *Correction, Jan. 28, 2016: This post originally misstated that Tom Cruise had founded the 9/11-related Scientology program; he was a co-founder.